The Teletubbies addon adds 5 new mobs (not entirely new ones) that will remind you of early childhood or yesterday for someone. The addon is pretty simple and will not bring anything supernew or unusual, the main characters are teletubbies being peaceful and lovely creatures with antennas on their heads. They can be tamed if you want to collect all the teletubbies next to you. In fact, the addon adds only one Tinky Winky but if you spawn several mobs, then there is a high probability that he will change his color. 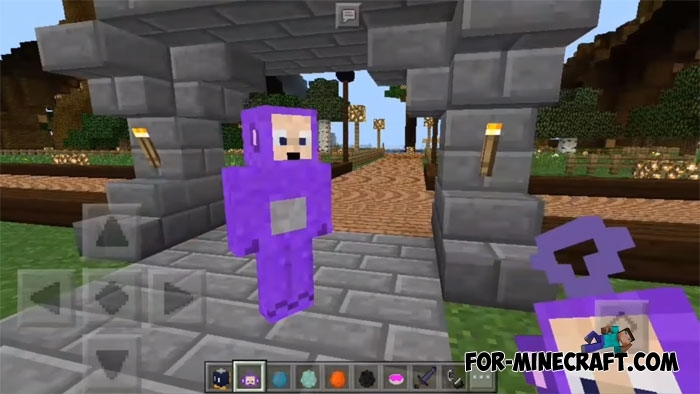 In addition to the teletubbies, there is an improved ghast and creeper, as well as a dangerous skeleton. Updated mobs are stronger and look better. Create an army of the teletubbies and tame them to defeat any boss. Mutant Creatures for Minecraft PE 1.1If you do not know how to increase the complexity of the game then install the Mutant Creatures addon..
Block Launcher 1.23.3 for Minecraft PE 1.10.0(Release)/1.11.0.5Block Launcher is a popular launcher for Minecraft PE which allows you to quickly install scripts, mods, addons, textures, skins without reinstalling MCPE.. The MCPE Army mod for Minecraft Pocket Edition 0.10.0Modes give you the opportunity crafted a variety of weapons, from the most ancient to modern!